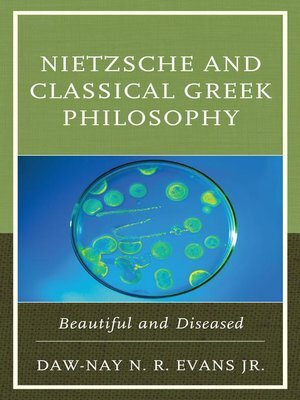 by Daw-Nay N. R. Evans Jr.
Nietzsche and Classical Greek Philosophy: Beautiful and Diseased explains Friedrich Nietzsche's ambivalence toward Socrates, Plato, and Aristotle. Daw-Nay N. R. Evans Jr. argues that Nietzsche's relationship to his classical Greek predecessors is more subtle and systematic than previously believed. He contends that Nietzsche's seemingly personal attacks on his philosophical rivals hide philosophically sophisticated disputes that deserve greater attention. Evans demonstrates how Nietzsche's encounters with Socrates, Plato, and Aristotle reveal the philosophical influence they exercised on Nietzsche's thought and the philosophical problems that he sought to address through those encounters. Having illustrated Nietzsche's ambivalence Socrates, Plato, and Aristotle, Evans draws on Nietzsche's admiration for Heraclitus as a counterpoint to Plato to suggest that the classical Greek philosophers are just as important to Nietzsche's thought as their pre-Socratic precursors. Daw-Nay N. R. Evans Jr. is assistant professor of philosophy and African American studies at Lake Forest College. More about Daw-Nay N. R. Evans Jr.